Team USA has defeated Australia by 33 points at the Olympic Quarter finals today. Australia were coming out of a win over Russia in the preliminary rounds only to face team U.S.A at the Quarter finals. The Boomers played well for 3 of the 4 quarters, not letting team U.S.A get to far out in front. The last quarter was where the Boomers fell and team U.S.A just surged ahead. The first half saw a nervous Boomers squad miss many open opportunities, missing free throws and lay ups; but they still held a respectable 21-28 first quarter. The second quarter was very similar to the first with the U.S.A getting up by a further 7 points to take the lead to 14 going into the second half. "The players have lost confidence in the ref's ability not to be intimidated by the reputations of Team U.S.A. Not that I'm saying that the call was incorrect." 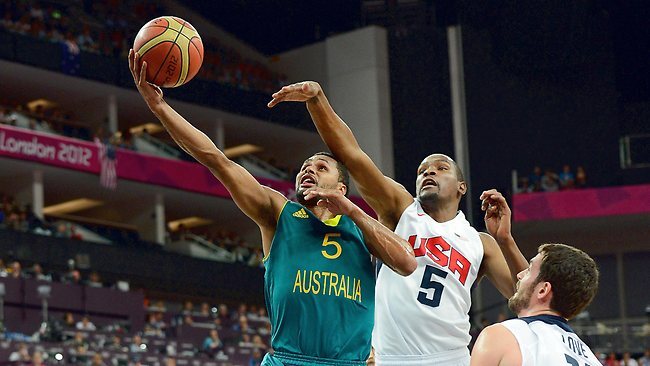 The final quarter saw the Boomers fall apart and team U.S.A capitalize. From 12 down Kobe Bryant hit his hot streak and sunk three 3 pointers in a row without any points made from the Boomers. From there it was all downhill. James Hardin made some huge alley oops and dunks. Every play became a show for team U.S.A displaying their incredible skill to finish the game up by 33 points, at 86-119. I was surprised that Brett Brown did not give the bench players a run in the dying minutes just to get to play against the best in the world. Adam Gibson and Peter Crawford were the only two players not to get any minutes on the court. Patty Mills was the top scorer for the night finishing with 26 points, 6 rebounds and 2 assists followed by Kobe Bryant who finished with 20 points. Kobe had a slow start to the game going 0 from 4 but was on fire later in the game. Joe Ingles played the full 40 minutes and was probably our best player for the game finishing with 19 points, 8 rebounds and 6 assists. Lebron James had a triple double with 11 points 14 rebounds and 12 assists. Aaron Baynes had a highlight in the dying seconds of the game, with a huge block on Anthony Davis to close out the game. Matthew Dellevadova played well for the majority of the game, but gave up a couple of turnovers in the last quarter. He is a strong point guard and the team looked better when he was playing the point and Patty was in the no. 2 spot. It was a good game that should have been closer for how the Boomers played for the majority, but they were out classed in the final quarter. It was unfortunate we did so poorly in the preliminary rounds. If Australia had won one of those losses we would not have faced America so early and could have faced an easier team in the quarters finals. After Russia was defeated by the Boomers, they defeated Lithuania 83-74 and are now set to play Spain in the semis for a shot at the final.